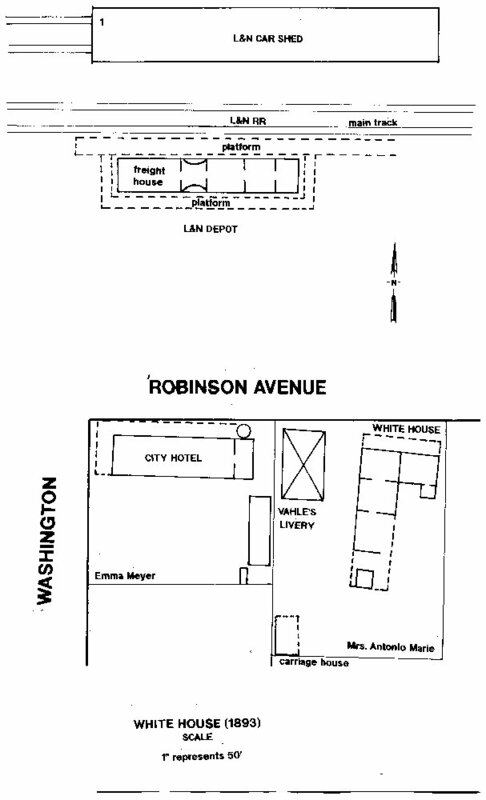 The White House was located south of the L&N Railroad depot on Robinson Avenue. It was just east of the Vahle and Eagan Livery Stable in Block 24 of the Culmseig Map (1854) of Ocean Springs. The White House was a single story, wood framed building with a shingle roof. It had a front gallery of 450 square feet which faced the L&N Depot to the north. The structure had a living area of 1461 square feet contained in four rooms. On the west side of the building there was a room of 475 square feet which was designated as a store. It probably served as the saloon. The kitchen was 120 square feet in area. It was detached from the main building and located on the back gallery which was 775 square feet in area. Charles E. Schmidt was born in New Orleans of German parentage. He came to Ocean Springs and met Laura Coyle, the daughter of an immigrant Spanish Menorcan father, Francisco Coyle (1813-1891) and Magdalene Ougatte Pons (1813-1904). They married in 1874. At Ocean Springs, the Schmidts were merchants and reared six children: Euphemia Magdalena Beyer (1876-1954+), Francis Ernest (1877-1954), Theodore Charles (1879-1954+), Louis Victor (1880-1953), Magdalena Joachim (1882-1971), and Emilia Dolores (1884-1884). Their son, Francis Ernest, owned a bakery on Washington Avenue (1901-1938), and served as Ward One Alderman (1915-1922 and 1925-1929) and Mayor of Ocean Springs from 1935-1938. A son of F.E. Schmidt, Charles Ernest (1904-1988) would write Ocean Springs French Beachhead (1972), the first comprehensive history of the city, and also serve as Mayor (1961-1965). Two other sons, Frank O. Schmidt (1902-1975) and Harry J. Schmidt (b. 1905) would become prominent physicians on the Mississippi Gulf Coast. Mr. Charles E. Schmidt, commonly called "Handsome Charlie" has opened a retail family grocery store and says he will sell goods as cheap as anybody. Schmidt keeps almost everything good to eat in his store and at his other establishment (White House) everything good to drink. (November 7, 1879). Unfortunately in 1886, Schmidt met an untimely death at the age of thirty-five, and left Laura with at least five young children. She married Michael J. Brady (1838-1919) in June 1895 and had another child, Mary Agnes Brady Mitchell (1896-1974). Antonio Marie (1829-1885) commenced operating the White House in 1881. Marie was born in Spain and married Mary Artemise Rodriguez (1840-1912), the daughter of Spanish immigrant, Juan Antonio Rodriguez and Marie-Martha Ryan. Rodriguez had received a patent on Lot 5 of Section 13, T7S-R9W from the U.S. Government in 1848. Lot 5 comprises lands along Bayou Porto and Old Fort Bayou in the western area of the Gulf Hill Development. In December 1885, Antonio Marie died intestate at Ocean Springs. His estate consisted primarily of four coastal schooners: the Sea Witch, Esperanza, Hortence, and Maud. 20 beer glasses, 8 chairs, 1 base ball club and deer horns, 2 round tables, 1 large mirror, 2 plaster images, 1 marble top wash stand (damaged), 1 ice stand, and 1 beer closet ( 1 door off). According to The Pascagoula Democrat-Star of December 28, 1892, "the Messrs. Vahle have taken a long lease on the "White House" Property and have erected thereon a livery stable". The Vahle Family of German ancestry came to Ocean Springs from New Orleans circa 1890. Catherine Vahle (1838-1914), the matriarch and a widow, had at least six children: Caroline Nill (1862-1949), wife of Ocean Springs druggist, Herman Nill (1863-1904), Anthony Vahle (1864- 1930), Louise Billick (1876-1957), Mamie Curtis (1873-1957), Casper Vahle (1869-1922), Theresa Friar (1871-1956), and John Henry Vahle (d. 1910). The firm of Vahle & Egan furnished us with cariages upon all occasions and we were rather surprised to find in a town of this size such a finely equipped livery stable. Messrs. Casper Vahle and Richard Egan are both young enterprising, energetic business men and have built up a fine trade since their partnership, which commenced in March, 1894. Previous to this, both members of the firm had conducted livery stables of their own. They have a number of fine driving horses and several speedy matched pairs and a number of carriages to select from, among which are tally-hos, three and two-seated surries, buggies, wagonettes, transfer wagons, and they also have several teams for heavy hauling. After Egan's untimely death in 1896, the business appears to have dissolved as Soden & Illing were operating a livery at this location in 1898. The dilapidated old lady that has stood for years opposite the depot-antiquated relic of byegone days- is now being torn down by the owner, Jerry O'Keefe. The old structure was at one time one of the principal business places of the town. It was known as the White House, and was a hotel and barroom. Old residents tell of great doings at the old tavern. Of late years it has fallen into decay and has not been inhabited for a long time. Something more substantial and ornamental will doubtless be built in its place. The heirs of Jeremiah O'Keefe developed the property having a service station, taxi service, etc. here and on the adjoining property in the 1920s. Ray L. Bellande, Cemeteries Near Ocean Springs, Mississippi, "Rodrigues-Seymour Cemetery", (Bellande: Ocean Springs -1992), p. 125. C.E. Schmidt, Ocean Springs French Beachhead, (Lewis Printing Services: Pascagoula-1972), pp. 134, 135, and 137. The History of Jackson County, Mississippi, (Jackson County Genealogical Society: Lewis Printing Services: Pascagoula-1989), pp. 272-273. Harrison County, Mississippi Chancery Court Cause No. 3962, The Estate of Mary Marie, August 1911. The Pascagoula Star, July 27, 1873. The Pascagoula Star, “Ocean Springs Items”, February 4, 1881. The Pascagoula Democrat-Star, “For Sale”, September 2, 1881. U.S. Census-Jackson County, Mississippi (1850, 1860, 1870, 1880, 1900, and 1910). Sanborn Map Company (New York), "Ocean Springs, Mississippi", (1893)-Sheet 1.